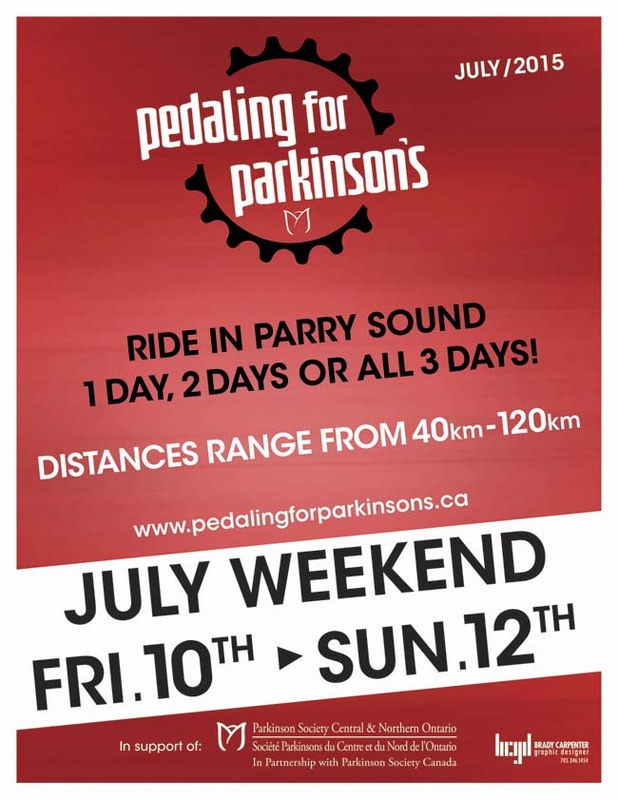 In 2011, longtime friends Peter and David founded a new event, "Pedaling for Parkinson's", to raise awareness and research funds for Parkinson's. Over three days, cyclists pedaled over 100,000 pedal strokes; 1 pedal stroke for each Canadian diagnosed with Parkinson's. Our inspiration was David's father, diagnosed with Parkinson's, and a close friend/neighbour of Peter's recently diagnosed with Parkinson's. In 2011, 20 riders participated and over $18,000 was raised. In 2012, over 70 riders participated and over $54,000 was raised. In 2013, we eclipsed 100 riders and generated over $95,000! In 2014, with more than 170 riders over the course of the weekend the event raised more than $160,000! Planning is underway to run the event again on July 10th-12th, in Parry Sound, Ontario. We hope you will consider participating in the Pedaling for Parkinson's and help make a difference in the lives of people and families affected by Parkinson's. Ride in Parry Sound 1 day, 2 days or all 3 days. Distances range from 40 km to 120 km.